Marine Cargo Inland Insurance, also called goods in transit insurance, will cover damage to the goods. Express love for your family by insuring their happiness and security through Shaheen’s Helath Insurance Plan. Shaheen Insurance proven as one of the most reputable and brightest names in the insurance sector since it started operations in 1996 and its sustained growth over the last 18 years has secured a permanent place among the reputed insurers of Pakistan. SICL has a distinction to have Shaheen Foundation (PAF) as the major shareholder. Shaheen Window Takaful Operations is an alternative solution of conventional insurance. Its operations based on Takaful Rules 2012 of SECP. 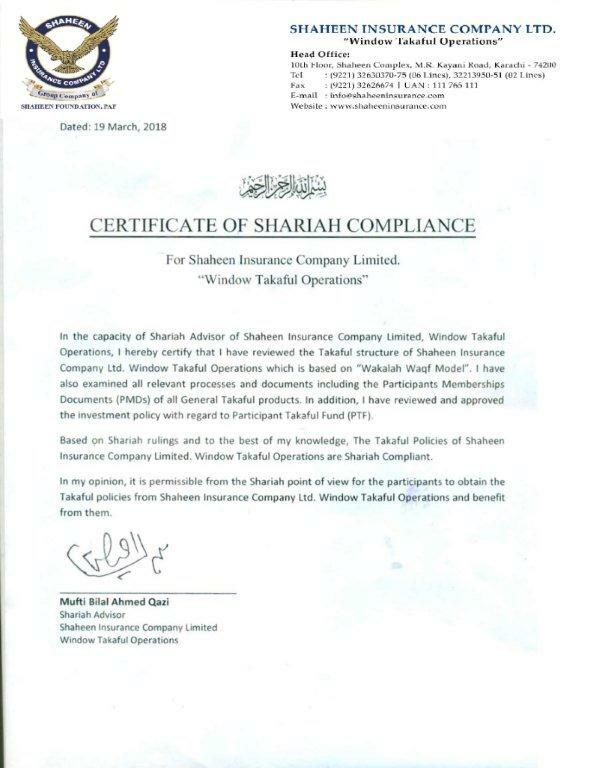 Shaheen Window Takaful Operations is a separate division of Shaheen Insurance Company Ltd which started its operations in April, 2018 after getting authorization awarded by SECP. Shaheen Window Takaful offering General Takaful Products to provide cover in all classes of General Takaful. Shaheen is “A” rated company with Stable outlook by PACRA rating agency. The Authorized Capital of the company is Rs 1 Billion out of which Rs 600 Million is fully paid. Shaheen Insurance Co Ltd. is a company of Shaheen Foundation which is fully owned by Pakistan Air Force. Our management team comprises of qualified insurance and Takaful professionals with over a decade of experience in the local market. The management is fully convinced of the Takaful concept and is also fully committed to implement and comply with the fundamental principles governing it. Its reputation for integrity and the highest ethical standards will ensure that all our business activities will be conducted ethically, professionally and efficiently. Our Shariah Supervisory Board comprises of trustworthy scholars who are duly qualified to issue fatwas on commercial and financial transactions, having vast experience and knowledge in the present day financial dealings and transactions. We have Re-Takaful arrangement with a consortium of internationally reputed Re-Takaful Companies such as Labuan Re, GIC Re, Africa Re etc. Shaheen Window Takaful Operations serve the nation through its branches all over Pakistan and ensure that the products and services offered are in accordance with the principles as recommended by Shariah Advisory Board. Shaheen Insurance Company Limited and JS Bank Limited entered into an agreement for “Auto Loan Insurance”. The signing Ceremony was held on April 23, 2018 at SICL Head Office Karachi. Shaheen Insurance Company Limited and JS Bank Limited entered into an agreement for “Auto Financing” whereby customers of both organizations stand to benefits from their combined strength. The signing Ceremony was held on June 3, 2015 at the JS Bank Head Office, Karachi. Shaheen Insurance Co Ltd. has recently signed an agreement with Soneri Bank Ltd. and First Punjab Mudarba (FPM) for the coverage of their Auto Financing Portfolio. This achievement will put another feather in SICL’s Cap. The Policy can also be extended to include accidental personal injuries to and death of Driver and Passengers. Vehicles used for business (Other than private Cars) or trade purpose are Commercial Vehicles. Shaheen Insurance offers Third Party Liability cover in addition to the covers mentioned above. This covers includes third party bodily injury and property damage. Although Third Part Liability is covered under comprehensive Motor Insurance Policy yet a separate cover for TPL may be granted on the request of the insured. This cover is required as the owner of the Motor Vehicle is liable to pay compensation to member of the community injured or killed due to his (motorist’s negligence). This is a type of insurance in which the insurer undertakes to indemnify the member of the community (insured) against any loss due to fire & lightning caused to his property which he got insured by payment of premium and obtaining a fire insurance policy. It provides timely financial help in case of damage to insured’s property. Consequential Loss Due to Fire & Allied Perils may also be covered in conjunction with Fire and Allied perils Policy. Terrorism means the use of violence for political ends and includes any use of violence for the purpose of putting the public or any section of the public in fear. Insurance policy issued to cover terrorism is in fact an extension of riot & strike damage cover. This policy covers loss or damage to the property insured by explosion or otherwise directly caused by an act of terrorism committed by a person or persons acting on behalf of or in connection with any organization. Who can take the terrorism cover? The riot and strike, civil commotion and malicious damages. Any act of any striker or locked out worker done in furtherance of strike. Any act of lawfully constituted authority to suppress any existing disturbance of the public peace. Loss of earning, delay or of market. Burglary, housebreaking, theft or larceny. The Policy can also be extended to include accidental personal injuries to and death of Driver and Passengers. Terms and conditions as per standard motor insurance policy apply. Marine Cargo Inland Insurance, also called goods in transit insurance, will cover for the loss or damage to the goods in transit within the country transported by rail/road. Goods and/or merchandise imported or exported from various parts of the world are covered against loss and/or damage, destruction and disappearance, while in transit on board an ocean going vessel from port of loading to the port of discharge. Cargo is normally insured against sea perils including war risk. Shaheen provides Marine Cargo insurance coverage for imports and exports as per the needs of the client. Three broad types of covers are available i.e. Institute Cargo Clauses “A”, “B” & “C”. The cover takes care of risks associated with different modes of transportation. Secure Travel Plan covers and assists travelers anywhere in the world in the event of a sudden illness or accident during journeys outside their country of permanent residence. 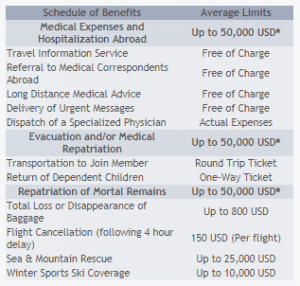 The travel insurance plans particularly designed to fulfill the “Schengen Visa” requirements. Shaheen Insurance Company Limited in collaboration with our global partners, MidEast Assistance International S.A.L, and 100% coverage reinsured by the Dutch “Eurocross Assistance”, one of the leading assistance and insurance service providers in Europe and a 100%owned subsidiary of pan-European insurance alliance Eureko (a Standard & Poor’s A+ rated financial service group). MidEast Assistance International S.A.L owns a “Web-based travel insurance issuing system” the e-Cover System that allows authorized representatives to provide their customers with electronically signed certificates of coverage protecting them against travel contingencies..
Customers can now view their existing travel insurance policy online, check the Authentication Key of your policy on the website www.mideast-assistance.com to avoid legal pursuit. In order to receive the benefits under this plan, the beneficiary must contact the appropriate Alarm Centre within 48 hoursof the occurrence of the event. * Period of Coverage: Up to 92 consecutive days abroad per trip, (the student policy covers 184 & 365 consecutive days respectively). Family package: Includes insured, spouse up to age limit of 70 years and 3 children under 18 years, (both husband & wife should exist on the policy, it is mandatory). 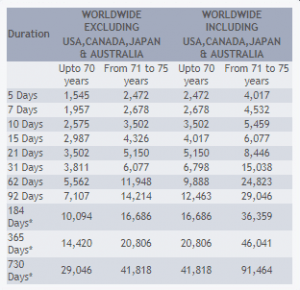 Age Limit: Up to 75 years (for student plan is between 16 and 50 years old). Refund: Government taxes are non-refundable. The insured must return the original policy with an application when requesting cancellation of this policy. Cancellation shall only be allowed before the effective date of the policy. When requesting cancellation, the insured’s original passport must be shown to an authorized executive officer of SICL and a letter from the relevant consulate in Pakistan must be presented allowing cancellation. A visa has been issued to the insured before the effective date of the policy. Or the insured has already travelled before the effective date of the policy. Pre-existing medical conditions or Childbirth: and any related treatment, repatriation, evacuationor emergency room expenses are not covered under this plan. Medical expense limit: 100% for each family member. 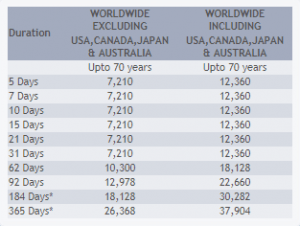 Deductibles per person per claim: USD 100 if the insured is under 70 years old and USD 250 if the insured is between 71 and 75 years old. Scope of coverage: Worldwide (excluding the country of permanent residence and the country ofcitizenship). Please refer policy terms and conditions for further details. If you are running a retail shop or a service business one of the most import things for you is protection against loss or damage to your business establishment. Express love for your family by insuring their happiness and security through Shaheen’s Personal Accident Plan. A person who is covered under this policy will be protected globally. Any person can buy this product that is above 18 years and below 65 years of age. The policy will be effective after 5 working days of premium realization and cancelled at the customer’s request at any time by calling directly to the company or through our authorized distributors. This policy does not cover loss caused by or resulting from internationally self-inflicted injury, Suicide, War, Flying other than as a passenger, pre-existing condition, AIDS, HIV, professional or hazardous sports, any unlawful act etc.